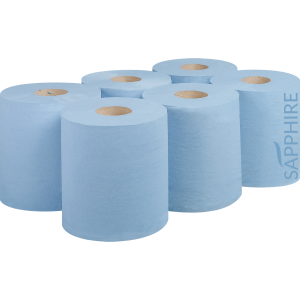 The Sapphire 3 ply centrefeed range is ideal for customers who require a stronger and more reliable centrefeed. 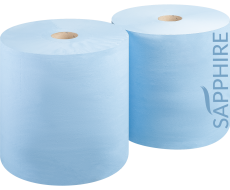 Adding a third ply to a centrefeed provides extra absorbency and gives increased strength that a 2ply roll lacks. 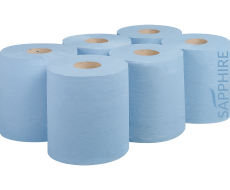 Made from Fourstones recycled tissue paper and following CHSA guidelines, we assure quality and accurate lengths. 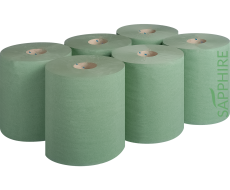 – UK Manufacturer – Food safe – Easy to tear – Absorbent and Extra Strong – Shrink-wrapped to ensure rolls are protected – Fits most standard centrefeed dispensers – CHSA accredited.